$AUDI A8 D3 4E 2007 3.0TDI AUTOMATIC GEARSHIFT SELECTOR MECHANISM 4E2713041BC AUDI A8 4E D3 2007 3.0TDI AUTOMATIC GEARSHIFT SELECTOR MECHANISM PART NUMBER - 4E2713041BC WE SUPPLY GENUINE USED AUDI PARTSWe maintain a clean and safe environment and are fully licensed and regulated by the Environment Agency. Audi parts available off the shelf, and because they are all genuine parts, quality and correct fitment is always guaranteed. Please do not hesitate to email or call us if you have any inquiries Contact numbers- 07807118497 or 07581379600 Please be aware that all items may have usage marks on them in the form of scratches as they are not brand new GLASS AND BODY PANELS WE PREFER LOCAL COLLECTION DUE FRAGILE NATURE BUT WILL POST HOWEVER IT IS DONE SO AT BUYERS RISK. 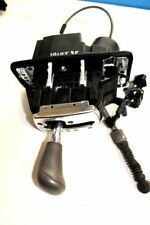 PART: 2017 Audi A3 Leather Black Manual 6 Speed Gear Lever Knob 8V0 863 278 S PART NUMBER: 8V0 863 278 S ADDITIONAL COMMENTS: N/A WARRANTY (PARTS ONLY): 3 MONTHS – FREE 6 MONTHS – AN ADDITIONAL 10% OF BUY IT NOW PRICE 12 MONTHS – AN ADDITIONAL 20% OF BUY IT NOW PRICE NO WARRANTY INCLUDED ON CORE UNITS (ENGINES & GEARBOXES) WE DO NOT OFFER EXTENDED WARRANTIES ON PARTS THAT HAVE BEEN ACCEPTED AS A BEST OFFER FAILURE TO SUPPLY ANY EXCHANGE ENGINES OR GEARBOXES WILL INVALIDATE YOUR WARRANTY WE DO NOT COVER ANY LABOUR COSTS EXCHANGES: ENGINES, GEARBOXES & DPFs/CATs ARE SOLD ON AN EXCHANGE BASIS – PLEASE MESSAGE US THROUGH EBAY AND WE WILL COLLECT THE CORE UNIT FREE OF CHARGE RETURNS: ALL RETURNS MUST BE PROCESSED THROUGH EBAY IF YOU WOULD LIKE TO REQUEST A RETURN: 1. FIND OUR ITEM IN YOUR PURCHASE HISTORY 2. Donor Car: 2004 Audi A3 8P Sportback 2000cc Quattro Sport. The New and Used Audi Parts Specialist for all Audi models worldwide. Audi Part Number: unknown. It may fit others. Donor Car Colour: Bodywork is Red LY3J. AUDI A1 A3 A4 A6 A8 TT Q3 Q5 Q7. GEAR KNOB SHIFT STICK LEVER BADGE. Our Part Number : YTA17 BADGE. Donor Car: 2002 Audi S8 D2 FL 4200cc Quattro Sport. The New and Used Audi Parts Specialist for all Audi models worldwide. Audi Part Number: Unknown. It may fit others. Donor Car Colour: Bodywork is Blue LZ5L. Donor Car: 1988 Audi 100 C3 2226cc. The New and Used Audi Parts Specialist for all Audi models worldwide. Audi Part Number: Unknown. Donor Car Colour: Bodywork is Blue LY5U. Interior trim is Blue 828/ NQ. Donor Car: 1999 Audi A3 8L 1600cc. The New and Used Audi Parts Specialist for all Audi models worldwide. It may fit others. Audi Part Number: 1J0 711 061 A.
Donor Car: 2009 Audi A4 B8 Saloon 1800cc. The New and Used Audi Parts Specialist for all Audi models worldwide. Donor Car Colour: Bodywork is Grey LZ7L. Interior trim is Black N2M/GD. Audi Part Number: Unknown. Fits any car with the ARY engine code. Engine bay wiring loom -. Good used condition. No part of the loom has been cut and it is fully functional with no issues whatsoever. Audi TT 2002 1.8 20VT 180BHP. AUDI A4 2007 5DR SALOON S LINE 2.0 TDI LEATHER GEAR LEVER GAITER AND GEAR KNOB. 4L2 713 041 AF. - 4L 271 310 5B. REMOVED AN AUDI A3 8V. WILL FIT STRAIGHT ON. Donor Car: 2001 Audi A3 8L 5 door 1900cc. The New and Used Audi Parts Specialist for all Audi models worldwide. Audi Part Number: Unknown. It may fit others. 1.6 TDI DIESEL. 2013 AUDI A1 8X. 5 SPEED MANUAL. AUDI A4 B8 8K 2009-201 5 AUTO AUTOMATIC GEARBOX GEAR SELECTOR KNOB & GAITER IN GOOD USED CONDITION. RHD - RIGHT HAND DRIVE CAR ONLY. VAG PART NUMBER: 8K2713139A. 2008 AUDI A5 8T. 3.0 TDI DIESEL. 6 SPEED MANUAL. 170K MILES. Audi Oem V6 dsg gear knob. In white/light grey leather. My TT had both black and white leather trim when ordered from the factory and this was sat in a bag in the boot, it has obviously been used but not much. Collection welcome. 8K2713041F Donor Vehicle AUDI B8 A4, 8T A5 2007-2012 Condition Important Information. REMOVE FROM AUDI A4 B7 2.0 TDI ,ESTATE 2005 YEAR,140 BHP,6 SPEED MANUAL GEARBOX HCF,ENGINE CODE BLB,PAINT CODE LY7G GREY. MY AIM IS TO MAKE SURE YOU ARE ALWAYS 100% HAPPY! Excludes : Channel Islands, Isle of Wight, Isle of Man, Sicily Isles, Scottish Highlands, Scottish Islands, Northern Ireland! AUDI A6 C6 2004-2008. GEAR STICK SELECTOR. Part Numbers are shown to enable you to make the correct choice when purchasing parts for your vehicle. Donor Car: 2004 Audi A4 B6 Avant 1800cc Quattro Sport. The New and Used Audi Parts Specialist for all Audi models worldwide. Audi Part Number: Unknown. Donor Car Colour: Bodywork is Akoya Silver LY7H. MOST ELECTRONIC COMPONENTS REQUIRE PROGRAMMING OR ADAPTION. LOW MILEAGE. GENUINE PART. CHECK PROPERLYBEFORE YOU BUY & CHECK ALL PICTURES. Audi Q7 4L Automatic Gear Selector Trim Part number 4L2713463A It is used car part so may have some wear and tear. Please check pictures before buying ( you are buying an exact item shown on the pictures above) is used car part so may have some wear and tear. If you have any questions please feel free to contact us. Shift knob shifter knob for Audi A1 A3 A4 A5 A6 Q3 Q5 6-speed. -Audi Q3 8U. -Audi A3 8 p Audi A3 8PA Sportback Audi 8P7 A3 cabriolet. -Audi A3 8V1 Audi A3 Sportback 8VA Audi A3 8V7 cabriolet. Shift boot and shift boot. Audi S4 B9 Gear Knob Automatic Leather Parking Brake. Original Audi A3 / S3 / 8 p ALU leather shift knob with leather cuff. Shift boot in genuine leather with "S3" emblem with red stitching. high quality tuning with Audi original parts. Shift knob aluminium with red ring. Donor Vehicle: AUDI A4 S LINE 2.0 TDI 6 SPEED MANUAL 2005. WORKS AS IT SHOULD. ANY LOCATION OUTSIDE THE UK. Arran - KA27 KA25. Oban - PH 33, PA20-49, PA60-80, KA28. Inverness - ALL. Shetland ZE1-3. Orkney KW15-17. Donor Car: 2004 Audi A4 B6 Saloon 1800cc Sport. The New and Used Audi Parts Specialist for all Audi models worldwide. Audi Part Number: Unknown. It may fit others. Donor Car Colour: Bodywork is Red LY3J. BREAKING FOR PARTS: AUDI Q7 AUTO 3.0TDI QUATTRO S-LINE 233BHP 171KW 2007. MAKE SURE THE PART NUMBER MATCH WITH YOUR OLD PART. All our parts are used second hand and off the shelf so may have storage marks on them. This listing is for the pictured gear knob removed from a 2014 Audi Q3. The part is in a good used condition and comes with a 90 day guarantee. If you have any questions please send a message / enquiry. Donor Car: 2007 Audi A8 D3 3000cc Quattro. The New and Used Audi Parts Specialist for all Audi models worldwide. It may fit others. Audi Part Number: 4E2 713 041 BC. DONOR CAR: AUDI A4 S LINE 2.0 TDI MANUAL SALOON. COLOUR CODE: LZ5A. BEFORE YOU SIGN FOR THEM . MODEL A4 B8 S-LINE. BODY SALOON. TRANSMISSION AUTO GEARBOX LTZ. PAINT COLOR WHITE LY9C. ITEM CONDITION. MILEAGE 86K. AUDI A6 4A5, C4 1994-1997 ESTATE. AUDI A6 4A2, C4 1994-1997 SALOON. AUDI A6 4A, C4 1994-1997 SALOON. AUDI A6 4A, C4 1994-1997 ESTATE. AUDI A4 8D5, B5 1994-2001 ESTATE. AUDI A4 8D2, B5 1994-2001 SALOON. (SECOND HAND). - AB36-38, AB55-56, FK17-21, IV1-39, IV52-54, IV63, KW1-14, PA21-40, PH19-26, PH30-41, PH49-50. Scottish Highlands. Suitable for Audi A6 4G C7. vehicle Audi A6 4G C7. gear shift knob 6-speed maual. Engine Cooling. manufacturer of the part Audi. colour DC7 moorbraun. External Lights & Indicators. OE-part number(s) 4G0863278D, 4G0863278D DC7. 2005 AUDI A6 C6 SALOON 3.2 FSI AUK QUATTRO AUTOMATIC GEAR SHIFT SELECTOR BLACK 4F2713041M. Isle of Wight. Channel Islands. Isle of Man. Will ask for proof/invoice of work done by specialist in cases of claims. GEAR KNOB & BLACK LEATHER GAITER 6 SPEED MANUAL. AUDI A4 8E. 1.9 TDI DIESEL. A6 C6 2005 - 2011. This is an auto gear lever in nut tree brown wood finish for the following cars This is a new,genuine Audi part. Part number. Alternative part numbers. Audi A3 S3 RS38V Models. This newly designed RS Sport gear stick has a top quality suede finish which gives it a modern unique look. Genuine OEM Audi Part! Donor Car: 2000 Audi A8 D2 FL 3697cc Quattro Sport. The New and Used Audi Parts Specialist for all Audi models worldwide. Audi Part Number: Unknown. It may fit others.